Upgrade public seating with the addition of resilient all-steel bollard style benches. 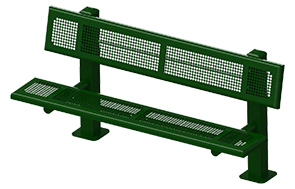 The seat and backrest planks feature a perforated pattern and smooth 3" tapering rolled edges sealed in a corrosion resistant UV-Stability polyethylene. The heavy-duty frame is engineered with 4" square posts, MIG welded 2-3/8"O.D. seat support arms and finished in an ultra-reliable powder-coating. Combining comfortable rolled edges, a durable construction and weather resistant finish, these 6' and 8' bollard style rolled edge benches are ideal for municipalities, schools and commercial outdoor applications.